In March, Italian documentary filmmaker Roberto Minervini received a special mention Nastro d'Argento (Il Nastro Speciale) for his film, The Other Side. It's recently been shown at the Palm Springs FilmFestival and Lincoln Center. On June 10, it will return to Toronto where it originally premiered last year at the Toronto Film Festival. The title most likely references “the tracks,” offering a portrait of America’s poor, surviving on a diet of beer, tobacco, heroin and crack in trailer homes in Louisiana and Texas. Minervini is becoming known for his hybrid form of filmmaking, which shows people essentially play themselves, creating the look and feel of a documentary, while the director clearly intervenes to create situations rather than observe them. His work is among the most interesting to emerge from the US in recent years, which may be surprising considering he is an Italian who has decided to poke his camera into the margins of American society. 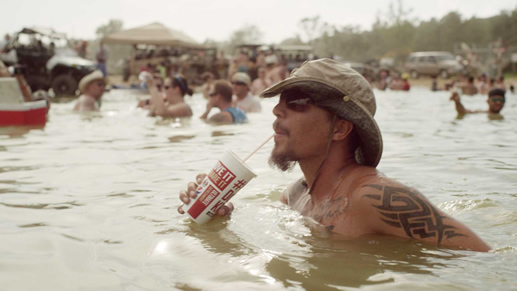 On the heels of his superb trilogy of Texas-based films (The Passage, Low Tide, Stop the Pounding Heart), Minervini moves his focus to Louisiana, where we come face-to-face with a group of people who seem to have stepped out of Deliverance. Faces carry the lines and scars of hard living, clothes are tattered, living conditions are chaotic. Some of his subjects are drug addicts; others are libertarian fanatics who hate the federal government. Yet Minervini finds a compassion and tenderness behind their gruff exteriors. Much of the film focuses on a small-time drug dealer and the girlfriend he lives with (and shoots up with). But, as The Other Side gradually shifts its attention to a group of local militia who are convinced that the feds are on the verge of declaring martial law and taking away their freedom, we are shown a more disturbing image of contemporary America. Sometimes it takes the eye of an outsider to provide a new perspective. Minervini is one such outsider. We feel he is at home with his subjects, as he peers into corners that many Americans choose to ignore.